It’s been a long time since we fought for the last time. I remember how tokens clanged. But then there peace came into our realm. Enemies stepped back into the shadows and it seemed they will stay there forever. I’m not going to say, that I do not miss those wild battles, but there was no way to fight them. We could only train our skills with friends. But last nights, I hear tokens breaking. Just like the last time, when enemy tried to overtake rule of our kingdom. Maybe it’s just an illusion, and maybe it’s a championship for the best shadow warrior. 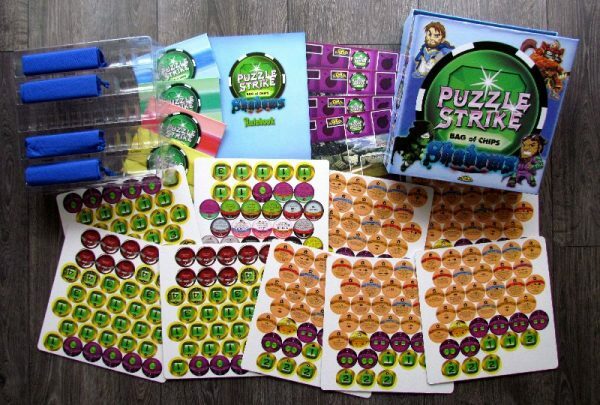 Such tokens are the main ingredient of Puzzle Strike board game, which comes to us again as a separate playable expansion with subtitle Shadows. Its author is David Sirlin and we will look at what he has been able to design under his own company Sirlin Games this time. And this time, there is a really big box with a huge token on the lid waiting for us. Nothing new? You only think! Several new characters are grouped around and it gives us a sneak peak on fighters in this expansion. 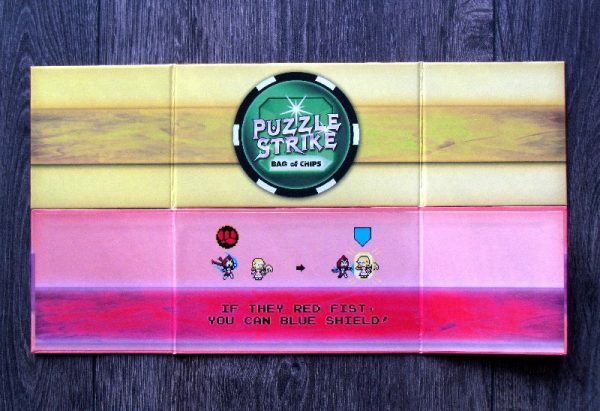 Inside the box, we find a plastic binder whose space is filled to the last place with a huge number of cardboard tokens. Specifically, we are talking about 342 tokens, that have their buying price on the top, underneath is the name and below are symbols of the available actions printed. At the beginning of the game, players must create a so-called bank. They choose a random ten different tokens, each in five pieces, to create an offer to buy from. Center of the table comes always with the basic stuff – a stack of gems tokens of increasing values and tokens of basic actions (combing, crash and wounds). Player has to choose his hero. Based on this character, he will receive three tokens with special skills, placed in a bag. 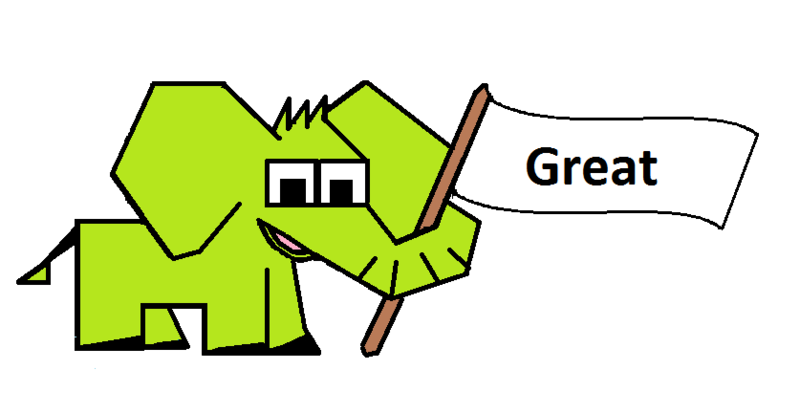 For this, each participant also takes six gem stones with a value of one and one crash gem. Set of ten tokens is in the bag and player pulls out starting hand of five tokens. He places screen in front of himself, but they do not have to hold tokens in his hand. They can place it on the table in front of them, so their opponents do not know exactly, what they are holding. The last important component for the game is game board, which everyone also places in front of himself. 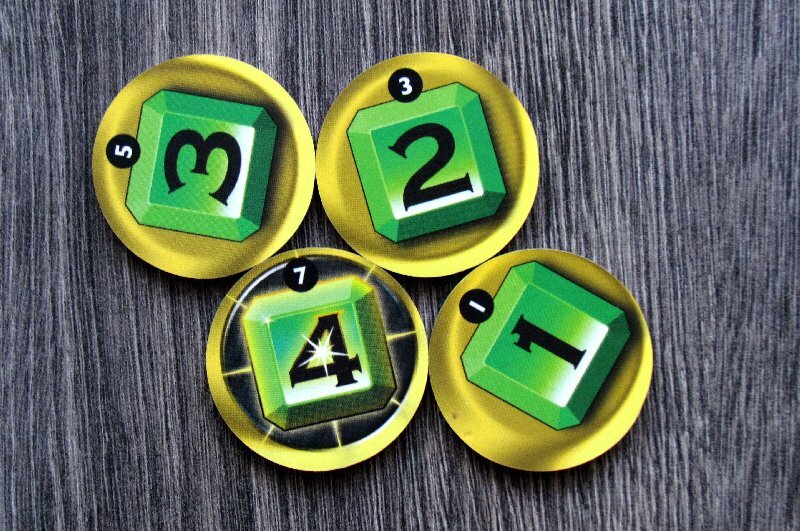 At the start of each round, players will add one crash token from the bank to their pile. 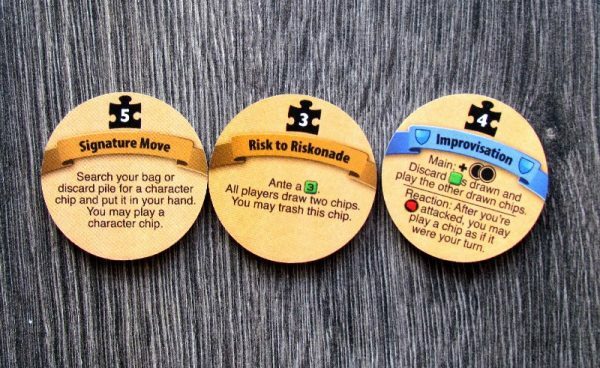 After that, player gets the chance to play one token from his hand, but this ability can tie up with others. Tokens may offer new action, but also some buying value. It will be used a few moments later to buy new tokens from the joint bank. These new bought tokens are placed on discard pile. 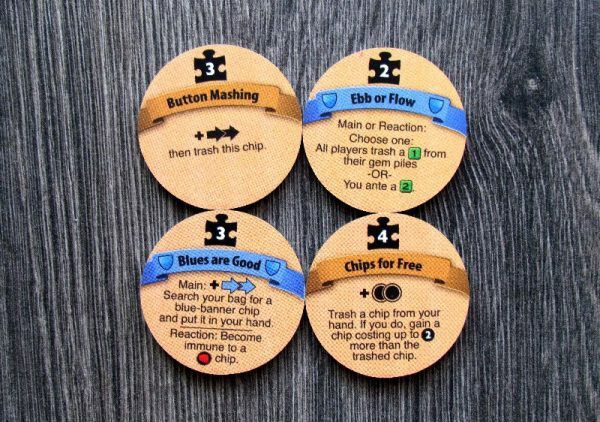 When player has no more tokens to draw, he returns discard pile in the sack and can use all tokens later. Central element of the gameplay is crashing of tokens. Players must first combine his stones into more valuable gems (or buy them). It is only then, when he may use those tokens to attack the enemies with the help of crash tokens, because such a shattered gem will bring its shards towards all opponents. 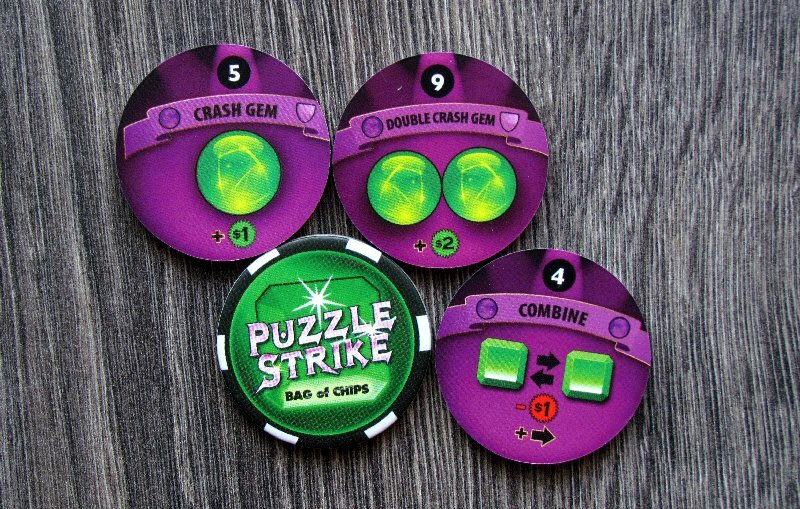 If a player has managed to keep a high stack of precious gems on his board, he gets a bonus with the ability to draw up to more stones for the next round (compared to the standard five). But the player does not want his pyramid to grow too much. Once pile has grown to maximum of ten stones, end of the game comes. Whoever has the least tokens in his pile, wins. So far, we have only described rules, that we all know from previous iterations. This is a classic Puzzle Strike, which is based on deckbuilding, but this time it uses tokens. This is nothing new, because there are a lot of other games on the market, which often use dice. But this is the only tokenbuilder we know. Shadows is a fantastic expansion that features first and foremost new characters. 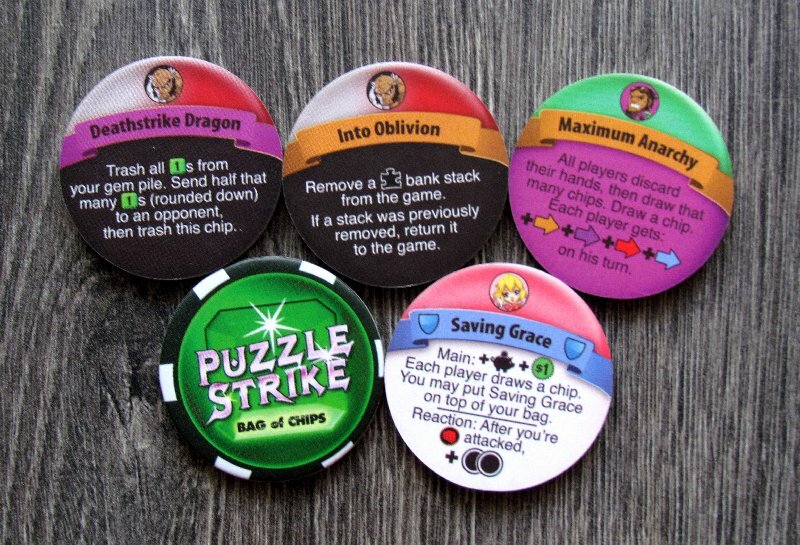 Each has his own set of tokens and capabilities that make each game unique. This exceptionality is always most noticeable at the beginning of the match, when these tokens come more often into hands, than in later stages. 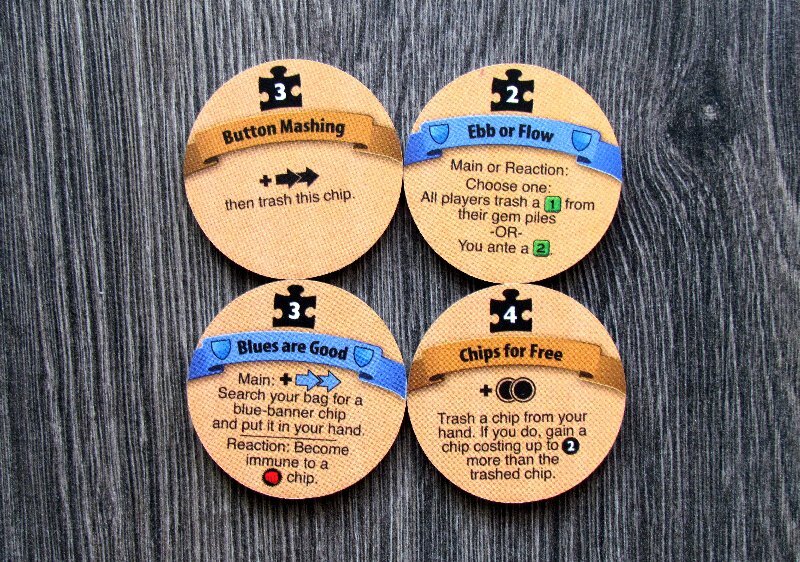 There is a bag filled with other purchased tokens, where players try to build their collection to the most agile combination. Some of the characters’ skills are really unique. 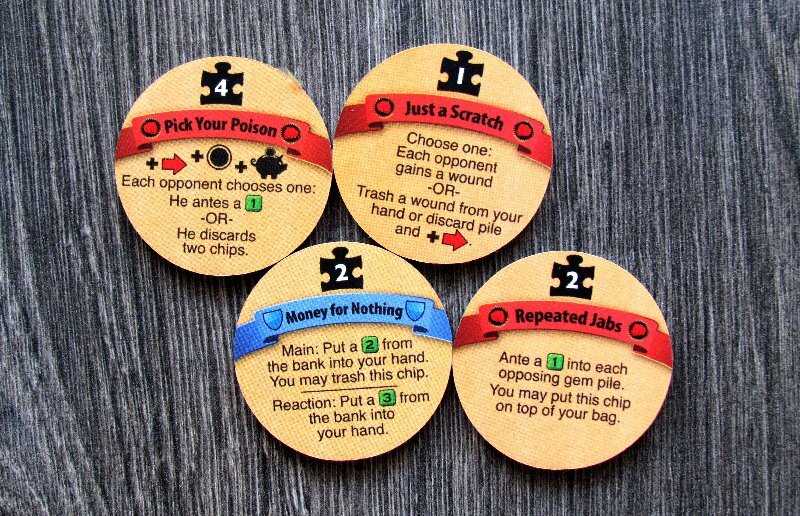 For example, the chance to drop token from the bank out of the game (and thus prevent the opponent from buying it), blocking the combination options. Some are one-time, but character tokens are also permanent, adding revenue or offer a way to collect already played tokens back into hand. 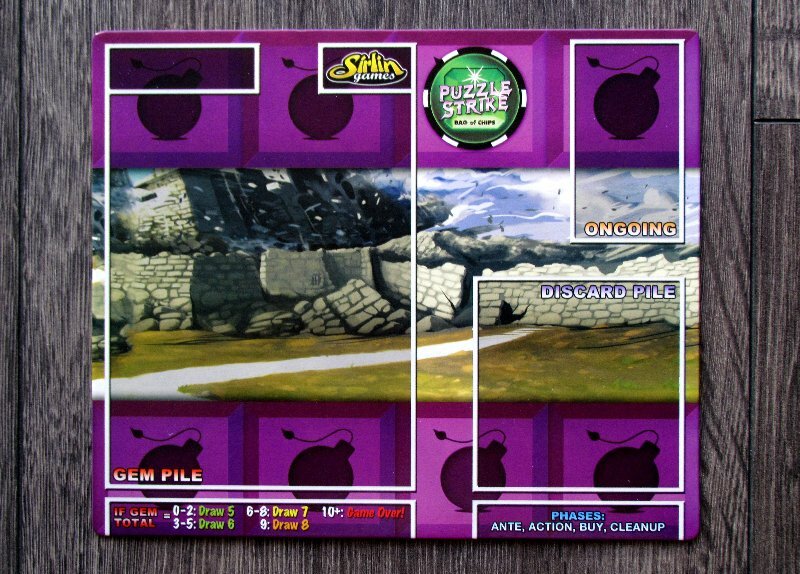 Puzzle Strike is a conflicting game. Players can not get to victory without attacking. 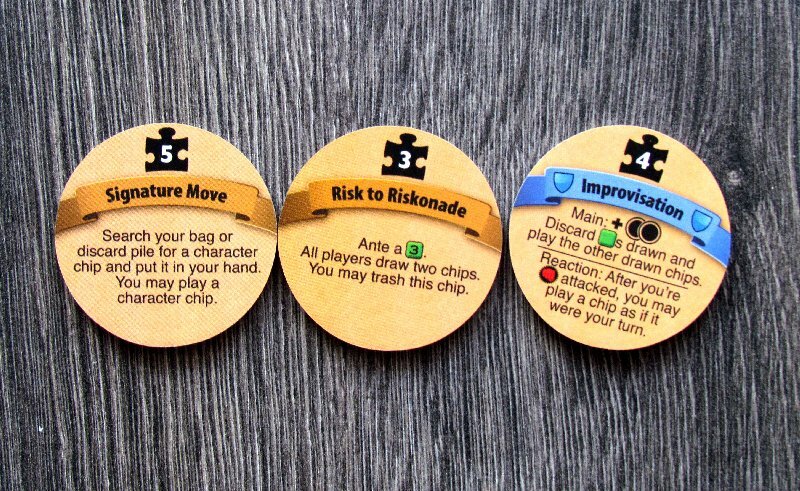 But, of course, the way to win is also a good set of tokens in your bag. 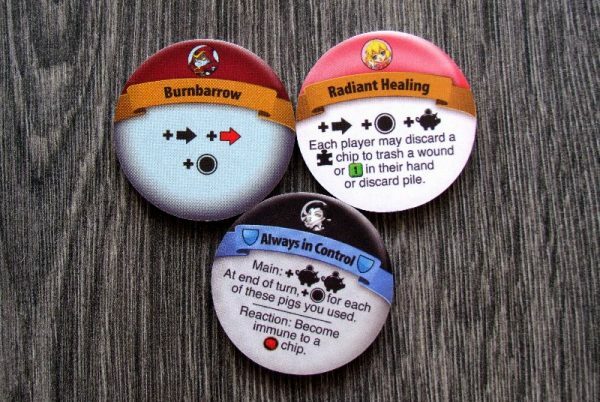 For example, color panic forces an opponent to discard specific tokens (color, which at the same time differentiates the token type). The Hammer allows you to add four tokens to your pyramid, which can then be effectively broken and sent to other players. Puzzle Strike remains a great entertainment even after several years of existence. Well, with the Shadows expansion, it gets a new breath. New characters and two dozen of tokens with new capabilities, it’s a huge world to discover. New combos and tricks you’ll be able to use and re-enjoy the feeling of a really conflicting battles. For lovers of Puzzle Strike, Shadows is a must. 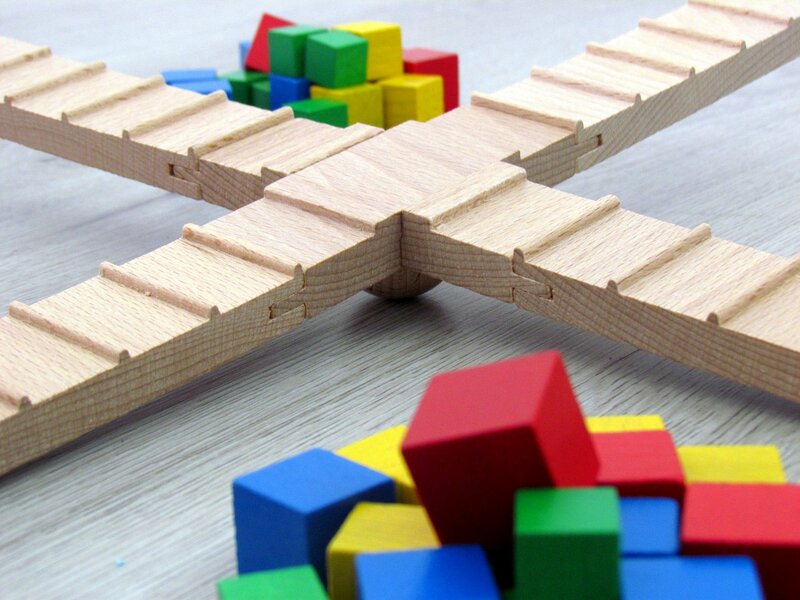 However, if you would like to enter the world of this token game with no experience, we would rather recommend a basic set that is more accessible and more suitable for beginners. But this expansion is definitely not in the Shadows, because it shines to all sides with fun! Puzzle Strike: Shadows is an expansion, whose only reason for existence is to increase variability. With this, there are excellent experiences in finding the best combinations of tokens. However, players do not lose anything throughout the game and no one has victory clear in advance. A lot of new skills means you have to discover tokens again. 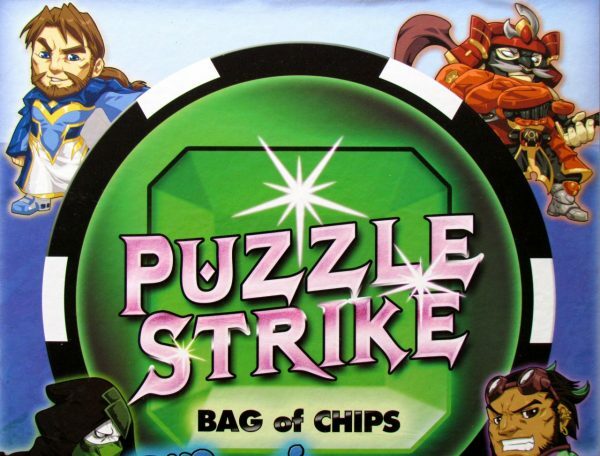 Puzzle Strike: Shadows can give away the joy of the gaming again.